I am the first to admit that I am a bit of a hoarder! Not quite as extreme as those on the TV and definitely more creatively inclined... I mean my junk has meaning and unique-ablity, I don't collect newspapers!!! Ha, although I could make a mean wreath with some newspapers if I had them... but I digress!!! A dear friend walked in to my 'office' (aka my catch-all craft room that I kicked my husband out of when I started to stay home over 3 years ago) and bluntly said... 'Wow, you have a lot of crap'!! I looked around and said... 'Well, yea, but I use it all...' And shifted my eyes over the multitudes of frames, fabric, pictures, jars, boxes, and about 100 other little knick knacks stacked around me!!! I know what it all is used for or could be used for, but really do I need 14 pickle jars??? Am I ever going to use the 10 wooden fence slats that I took from a neighbor's trash? Who knows??? But I'll be prepared if I ever do!!!! I like to craft and I love to repurpose things I find while shopping at Goodwill and Antique stores. Some people think I am nuts but more than not, most people think it's fun and volunteer to join me on my next thrifting trip . Either way, just so I remain sane, and my hubs doesn't force me back into the full time working world to pay for my junking habit, there are some anti-hoarding guidelines I try to adhere to!!! No one likes to be stepping over antique boxes and I don't want to box out my husband and kids with old wine bottles, just on the off chance I might make something one day with them! I keep only what I know I will use and if I haven't used it in a month of acquiring it, I either give it away, resell it or throw it out depending on what it is. I also reorganize and clean out areas of our house at least 2-3 times a year so that I simplify the clutter and reduce the stock pile of stuff. Lastly and most importantly, I make it a priority to move things around our house. Everything I buy or politely ask a neighbor for as he rolls his trash can to the curb has multiple uses!!! That way things are used often, in different ways around the house and don't get forgotten about. I may use a set of baskets in the boy's rooms for book storage, but a couple months later clean out those books and use those baskets for decoration in my kitchen or living room. In doing this, it also helps keep our home feeling new and cozy all year round!! Don't be afraid to look in those closets or clean out those drawers, you never know what you might find!!! Before you chunk out that empty pickle jar see if you can wash the label off and use it to store your kid's crayons in a fun way so that it makes them accessible to the kids more easily, and bonus for moms... crayons in a cute jar are a great table decoration!!!! Repurpose things, but don't hoard!!! Reuse old things that you thought you got tired of and if you see that you aren't going to use something, donate it or sell it!!! One man's trash is another man's treasure!!! Happy Sprucing!!! 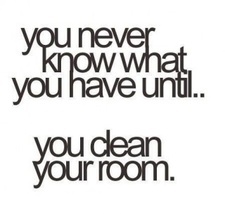 Let me know if you have any other fun cleaning/organizing tips or fun places to find hidden treasures!! !